The principal’s incapacity might be a temporary absence or illness. Yet some disabilities are permanent. If so, a spouse, relative or friend with POA can sign a deed or other real estate documents. This averts the need for the court system to intervene and assign a guardian or conservator. Any trustworthy, capable adult can hold POA. The POA document can also name a successor agent in case the principal’s first choice becomes unavailable. The principal might even designate co-agents. When appointing multiple agents, the document should state whether the majority may act without full consensus. The principal who creates the power of attorney must sign the document. Under state law, witnesses observe the agent’s signature, or a notary does, or both do. The agent signs the POA document, or a separate certification, as required by state law. A durable power of attorney takes effect upon its signing, and continues notwithstanding a finding of the principal’s mental incapacity or infirmity after its execution. Alternatively, a POA can be made to take effect when the principal becomes disabled. This is a springing power of attorney. The vesting language on the deed transfers the real estate from the grantor the actual current owner, not the agent to the new owner, the grantee. 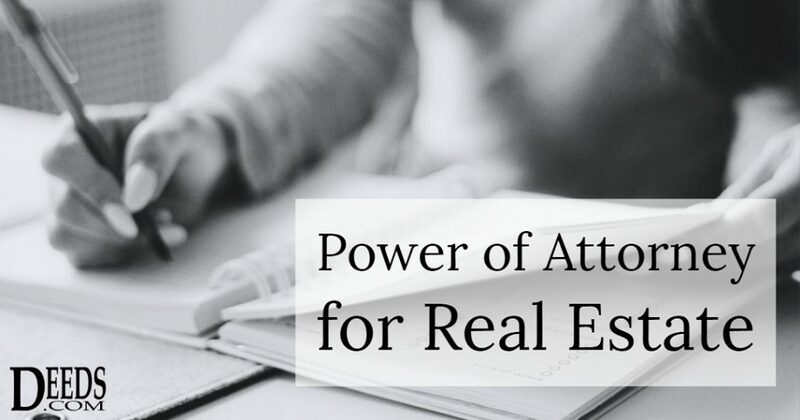 The agent writes the actual owner’s name, and then signs the agent’s own name with the identifier “Power of Attorney.” In other words, the principal’s name will clearly appear as the grantor, but the agent is signing as POA. The real estate transaction service company which provides title support will typically have a notary on staff, handling the paperwork. The notary block will identify the agent – the person who is physically signing – and will identify this person as the agent, although the grantor’s name will appear over the signature line. Check that the title insurance company will cover a conveyance under POA. Be sure the POA states that the agent may transfer real estate, so intent is clear. For springing POA, a title examiner may demand medical proof and a timeline of the principal’s disability. Check for gift language. When an adult child uses a parent’s POA and conveys the family home as a gift, the deed’s validity could be challenged if the POA lacks language allowing gifts of real estate. Familiarize yourself with county and state rules. Typically, the county recorder of deeds receives the POA document attached to the deed. This demonstrates the agent’s authority and the legitimacy of the conveyance for the record. Note that the agent may convey the home without having to amend its owner’s will, or to establish a family trust. Clear language to direct the agent’s activities is vital. A principal who is sound of mind may revoke the POA at any time. (A court can revoke a POA for a person who is not sound of mind.) When dealing with a real estate transaction, the principal should send a written notice of revocation to the agent. Limiting the POA to one transaction on a deadline is the best way to restrict an agent’s powers. A bank may have rules to prevent overreach as well. For example, it might require a minimum sale price for a home in the POA. An interested person (such as a close relative) must ask the court to review the POA if abuse is suspected. State law sets forth the definition of an interested person. Simply stated, an agent owes a duty of loyalty to the principal, and must always act in the principal’s best interests. Moreover, agents should avoid taking actions that directly or indirectly benefit themselves. Avoiding self-dealing or the appearance of self-dealing protects the integrity of the title, and prevents claims of fiduciary breaches. The agent must adhere to fiduciary duties according to a reasonableness standard. Courts apply this standard to determine whether an abuse of power has occurred based on an agent’s unreasonable conduct. To back up the reasonableness of decisions, an agent should perform careful accounting and keep detailed records of every transaction. A court will ask whether these records exist, and, if so, whether they demonstrate a failure to act in the best interests of the principal or not. The state may prohibit the power of agents to make gifts to themselves except where an agent is expressly empowered to do so in the POA document. Moreover, if clear language is not in a durable power of attorney allowing the gift to the agent, another person who feels slighted may attempt to set aside a deed. A classic example of illegal self-dealing is the case of Ricky Bradford Willson, authorized to handle his 90-year-old great-aunt’s affairs. Willson took her savings, conveyed her car title to himself, and signed a quitclaim deed to convey her Michigan home to himself, too. Willson ended up facing felony charges. One charge was for using a quitclaim deed in a fraudulent real estate transaction. A durable POA lasts until the principal revokes it – or dies. The closing will fail if the homeowner dies before the agent signs the closing documents. At that point the estate takes over the property. Paperwork signed by the agent will need to be done over. The language of the document itself can also terminate the POA. Time limits ensure that a formerly trusted person cannot retain the authority to act on the principal’s behalf indefinitely. This brings up the importance of checking important documents at regular intervals – especially if the principal moves or makes important lifestyle changes. The overview presented here does not substitute for an examination of your specific needs and facts. If you have concerns about using a power of attorney, contact an experienced attorney. Previous PostPrevious You’ve Paid Off the Mortgage. What Happens Now?